The Value of Learning is a hands–on guide for the implementation of learning and development programs that can be applied across all types of programs, ranging from leadership development to basic skills training for new employees. 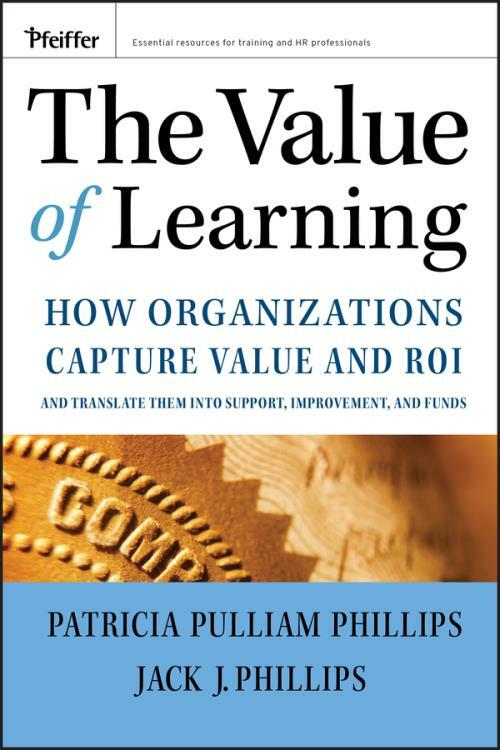 In this book, Patricia Pulliam Phillips and Jack J. Phillips offer a proven approach to measurement and evaluation for learning and development that can be replicated throughout an organization, enable comparisons of results from one program to another, and ultimately improve ROI. The authors reveal the techniques for identifying, collecting, analyzing, and reporting all seven types of data in a way that ensures reliable and reproducible results. In addition, this invaluable resource explores the challenges of collecting hard–to–measure data and shows how to place monetary values on the difficult to assess. Building on years of experience, application, practice, and research, the authors draw upon the results from organizations that have reached the ultimate levels of accountability the ROI. In an easy–to–read format that is filled with illustrative examples and tips, The Value of Learning is an important guide for anyone who seeks to understand more about bottom–line accountability. List of Exhibits, Figures, and Tables. Chapter One: Building a Comprehensive Evaluation Process. Chapter Two: Defining Needs and Objectives: Ensuring Business Alignment. Chapter Three: Measuring Inputs and Indicators. Chapter Four: Measuring Reaction and Planned Action. Chapter Five:Measuring Learning and Confidence. Chapter Six: Measuring Application and Implementation. Chapter Seven: Measuring and Isolating the Impact of Programs. Chapter Eight: Identifying Benefits and Costs, and Calculating ROI. Chapter Nine: Measuring the Hard to Measure and the Hard to Value: Intangible Benefits. Chapter Eleven: Implementing and Sustaining a Comprehensive Evaluation System. Appendix: How Results–Based Are Your Workplace Learning and Performance Programs? An Assessment for the L&D Staff .